There is nothing that I can say about the shooting of Michael Brown that hasn’t been said before by people whose experience affords them a perspective and an authenticity that I lack for the simple reason that I am white. No matter how deeply and ardently I want to empathize with the plight of black and latino and arab Americans who are racially profiled and harassed, I will always fail because I can never know what it’s like not to live with white privilege. Anything I say or write concerning racial prejudice against another group of people can be academic and it can be emotional, but it cannot be authentic because I have to imagine what it would feel like to have a cop stop and frisk me because of the color of my skin. I can point out the fact that the St. Louis, Missouri-Illinois Statistical Area is the 6th most segregated metro area in America, but that doesn’t mean I have the slightest clue what it feels like to be accosted by an overzealous security guard for the crime of shopping while black. A Hispanic woman living in Birmingham or a black man living in Oakland doesn’t have to imagine; they can just remember. Whether I want to admit it to myself or not, I am one of the majority and I have benefitted from the fruits of a racially biased system. I was brought into this world with an ivory spoon in my mouth and a get out of jail free card in my hand in a country that has blazed with the fires of racial violence for the entirety of its being. I am the negative image of Mike Brown. For the totality of my primary education, I attended a tiny private college preparatory school in Cincinnati called The 7 Hills School. Cincinnati being the historically Catholic town that it is, 7 Hills was, along with The Cincinnati Country Day School, one of the only two options for parents living in the city who wanted to provide their children with a K-thru-12 private school education, but didn’t want a heaping helping of Jesus to go along with it. When I was in primary school, the decision of whether or not you sent your child to 7 Hills or CCDS said a great deal about your the makeup of your family, specifically with regards to political affiliations. Located outside the city limits in the posh environs of the suburb of Indian Hill(1), the Cincinnati Country Day School has historically been the home of the city’s moneyed elite and can claim among its graduates the likes of US Senator Rob Portman, former Ohio Governor Bob Taft, Bush (43) White House Deputy Chief of Staff Joe Hagin and Florida Marlins Vice President and General Manager Michael Hill. If the school’s name sounds vaguely familiar, it might be because it became embroiled in a minor scandal after the movie Traffic was released with a scene in which one of the film’s coke- snorting teenage trust funders said that she attended Cincinnati Country Day during an interrogation scene. For their part, The 7 Hills School was kind of like CCDS’s wacky liberal cousin. Built within the city itself in two mixed-income neighborhoods, 7 Hills made up for its lack of upper-class pedigree with an experimental approach to teaching that was kind of a sampler platter of progressive educational philosophies. That’s not to say that the school’s student body didn’t overwhelmingly come from upper- middle class families (it did) or that the tuition there wasn’t prohibitively steep (it was). It’s just that the school’s reformist take on education attracted families and teachers who generally shared more radical designs concerning how and what children should learn. If 7 Hills had a major shortcoming while I was going to school there, it was that it was still mired in the sort of racial tokenism that is less about creating a genuinely multicultural learning environment than it is about being able to present the illusion of integration in your promotional literature. Having one or (on occasion) two black kids in a classroom doesn’t make a culturally competent school environment. Instead, it just forces the lone African-American student in the classroom into the awkward role of being the unofficial expert on blackness, and god help you if you’re the unfortunate soul who finds him or herself as the only black kid in an English class that’s discussing Huck Finn. I can’t speak from experience, but I don’t think that sitting through an hour long class where all of my white peers proffered their opinions on the societal appropriateness of the most toxic ethnic slur our country has to offer would be my idea of a good time. Many people—most of them white—feel that enrolling their kids in schools that reflect the ethnic and socioeconomic diversity of the regions they live in isn’t terribly high on their priority list. This is not to say that these folks don’t publicly express support for a diverse school environment, because many of them do. In fact, when asked about their general attitudes on the subject, 95% of Americans openly state that they believe black and white children should attend the same school. This may seem like a given to us now, but as recently as 1956 half of American whites were supportive of a segregated educational system. The fact that the vast majority of Americans now say that they support integrated schooling is major achievement, especially when you consider that some of those who support the practice now grew up in families that preached “segregation now, segregation tomorrow, segregation forever”(3). For somebody else, the prevailing wisdom has it, racially and economically mixed schools and neighborhoods are fantastic. But they’re not for us. My neighborhood and my family and my children will not be brought down by those people. Now, in this diverse, multi-ethnic, post-9/11 society of ours, the groups referred to as those people can be many and varied, but more often than not, the barb’s intended target is the same as its ever been in the hateful racial history of our nation. The fear and the vitriol and the disdain haven’t gone away. They’ve just moved to the suburbs and the exurbs, where they’ve taken on a gloss of wet, tolerant paint. Despite all this lovely rhetoric about living in a “post- racial America”, our nation’s public schools are more segregated today than they were in 40 years ago and the poverty rate among children of African-American, Hispanic or Latino, and American Indian descent is nearly 3 times that of white children. Government officials and policy wonks often focus on the fiscal effects of “racially isolated” minority school districts whose budgets are considerably lower than their majority white counterparts, but dollars and cents only gets at a small part of the problem. More than anything, it is the physical and emotional distance between white and non- white students that perpetuates a culture of race-based fear and distrust. It is this distance that not only allows tragedies like the murder of an unarmed 18-year old by a police officer in Ferguson, Missouri to occur, but provides them with an environment in which they are commonplace. That the murder of Michael Brown by the St. Louis County Police Department was sandwiched just days between those of Eric Garner by the NYPD and Ezell Ford at the hands of the LAPD is not coincidence and it is not an aberration; it is simply normal. Nor is it coincidence that Missouri Governor Jay Nixon (D), a man who was completely absent from any discussion or action in Ferguson for 5 days after the shooting took place, began his career as Missouri’s Attorney General in 1993 by filing a motion to scrap St. Louis’s court-ordered desegregation program. Over the past several days, many members of the media and the general public have made the observation that the images they were seeing of uniformed white officers with police dogs at their sides staring down local black residents and phalanxes of militarized law enforcement firing tear gas and rubber bullets at non-violent protesters look like scenes taken from the Deep South in 1964 rather than ones from a border state in 2014. How, many ask, can this be happening here now? How can this be happening when we have a black President and live in a “post-racial society”? I thought we were past this, they say, as if a couple of decades of half-assed bussing programs and affirmative action policies were going to undo more than 300 years of slavery and systemic oppression. Thus far, the hallmark of civil rights for blacks in the 21st century has been regression and loss. If you want to harp on Barack Obama’s race, then you’re more than entitled to do so, but his success in running for office has about as large a concrete impact on day-to-day experiences of African-Americans in this country as Oprah’s media empire does. The truly important things—the policies that aim to level the playing field for every one of us in this country—have been allowed to wither and wilt. Affirmative action, a policy that has enabled millions of people of color to attend universities that they otherwise would have been rejected from, has been weakened and exposed by a Supreme Court decision that deems it constitutional for states to enact ballot initiatives that ban the practice. The Voting Rights Act, a piece of legislation that had propped open the doors of polling places in the South and all across our country to previously disenfranchised minorities for close to 50 years, was slammed shut by a Supreme Court ruling that allowed 9 states with the longest histories of racially-based voter fraud to pass voting laws without the Federal government’s blessing. Our schools and neighborhoods are re-segregating, our justice system has been systemically rigged to incarcerate blacks at disproportionate rates for the same crime as whites, our voting rights safeguards are in tatters, affirmative action is in mortal danger, race-based income inequality is skyrocketing and our police forces have been allowed to stockpile obscene amounts of military equipment that have no utility outside of striking fear into the hearts of the people they have been sworn to protect. 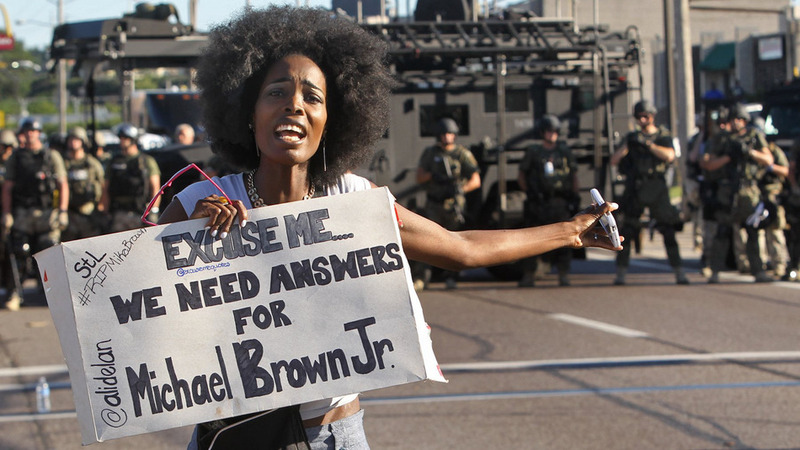 For me, the operative question isn’t how can this unrest in Ferguson be happening now? It is how has this unrest not happened more often? (1) To give you an idea of the type of ultra conservative money that makes its home in Indian Hill, the neighborhood was second only to Manhattan’s Upper East Side in donations to the Bush/Cheney re-election campaign in 2004. (2) According to the 2010 Hamilton County “Race Report”, the city of Cincinnati was 44.6% African-American and 48.1% White, with no other ethnic group getting more than 3% share of the population. By contrast, the much larger Cincinnati Metropolitan Statistical Area, which includes parts of Northern Kentucky and Southeast Indiana, is 12% African-American and 81.3% White. (3) This quote comes from former Alabama Governor George Wallace’s inaugural gubernatorial address in 1963, at the height of the pitched battle between the federal government and states in the deep south over desegregation in the wake of Brown vs The Board of Education and the burgeoning civil rights movement in America. In less than 6 months, Wallace would cement his legacy as the south’s most theatrically bigoted governor by standing in the doorway to University of Alabama’s Foster Auditorium, making an asinine attempt to stop 3 young men and women from becoming the first blacks to attend the school. Ironically enough, the man who once pledged to uphold segregation forever in 1963 only backed the institution for another decade or so. Shortly after he was paralyzed from the waist down after an assassination attempt while campaigning for President in 1972, Wallace recanted his earlier statement, acknowledging his wrongdoing and apologizing to civil rights leaders like John lewis for his actions. While you aren’t a person of color, you have paid attention and made the effort to understand that white supremacy, not black existence, is the problem. As long as people fail to see and understand that exclusivity and local government policies supporting white supremacy, segregation and exclusion in both violent and benign ways, then matters will continue to deteriorate around this nation. Those who think/thought America is a post-racial society definitely haven’t been paying attention, and/or just haven’t given a damn. Let me preface my statements by confessing I am white. However, I don’t think that disqualifies me from having an opinion about a subject of human concern. I went to high school with a white guy that later became a cop and on his first day on the job shot an unarmed black man to death–he was reaching for something in his glove compartment. Those of us who knew this cop, knew that he wasn’t a racist and that he didn’t intend to murder an unarmed black man. Did race play a factor? Did racism play a factor? Quite possibly. Racism in that he may have felt unreasonably that this particular black man posed a greater threat to his safety than he in reality did. On the other hand, inexperience was a likely factor as well. After all, it was his first day on the job. Could human error have also been a factor? Of course, some media outlets and other groups who feed on these kinds of stories immediately ran with this. It was yet another example of the whole black/white narrative of racial prejudice & injustice and so on. Protests, petitions & so forth–the whole bit. As I mentioned above, I think there was a racial aspect… It just seemed like everyone was concerned more about making their own point than about the truth of what happened or why.